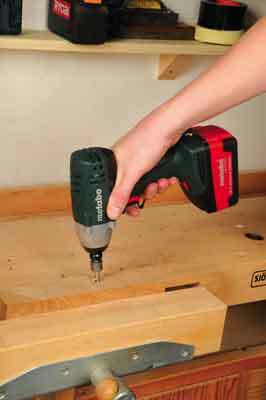 Metabo have included an impact driver/wrench in their new range. Naturally, we got them to send us one here at WPP for a try out. You will be award by now I am a fan of Metabo's gear. 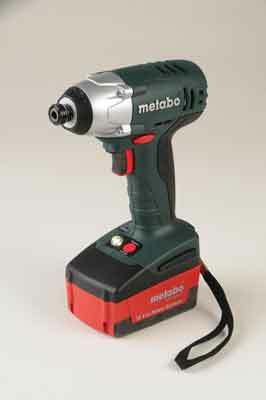 First up, the driver has the build quality you'd expect from Metabo. It has the usual overmould technology for the grips, and is well thought out and robust. The variable speed trigger is comfortable to use and the forward and reverse positioned above the trigger is simple to use, and even has a lock-off position. The 18v Li-ion battery slides off via a simple and robust push switch at the back, and has a wrist strap directly below. We used the power extreme battery with the drill, and found the driver had plenty of grunt. I drove two sizes of coach bolt into oak without pre-drilling, 6in and 3in, and the drill didn't have a problem at all. The 1/4in hex bits snapped in place with the usual SSD connection ease, and there is even a worklight to help you see what you were doing. What really sets the SSD 18 LT apart is its unusual torque/speed setting. At the push of a button you have three settings, for speed and torque. The lower the speed the higher the torque. You push the button once to change from setting one, to two, to three and back again. Handily the button flashes to say which setting it is on. One for setting one, etc. And during use, it keeps on flashing the necessary number of time. A nice little touch so you always know your setting. As you'd expect me to say, it's Metabo, so it's great kit. Yet again, Metabo have come up with those little things, on top of the great quality you'd expect, to make their tools usuable. In particular the three torque switch works a treat.